The 'Save the Ribble' Blog was launched over 4 months ago, in response to Preston City Council's 'Riverworks' proposals. Ordinary people from across Preston, Penwortham, South Ribble and the towns and villages that line our beautiful River Ribble were angered at the dangerous ideas contained in these proposals - including the idea of putting a barrage across the Ribble that would raise its level to permanent high-tide, and the idea of building over 4000 houses in the River's flood plain, over land that is currently used for farming, allotments and football fields. Since the blog was launched we have had a far better response than we could have imagined, with thousands of people visiting our site - over 6000 'hits' since we started counting them in the middle of May. We have posted over 50 posts in total, and have received numerous comments, poems, stories and photographs from pro-river readers. This post is intended to guide you through some of the most important posts on this blog - offering quick access to some of the key arguments against the Riverworks ideas. 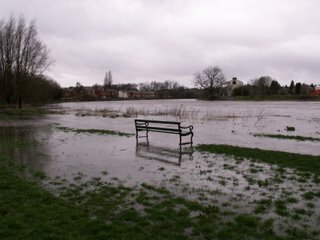 Here's a picture taken on March 28th 2006 of the Ribble in Penwortham, breaking its banks after heavy rain. If a barrage is built, the River level will be permanently higher. Instead of being regularly 'flushed' through by the rivers' tidal action, silts will gather behind the barrage and will progressively accumulate on the River bed - reducing the capacity of the River and its ability to deal with heavy rains. Rainfall run-off will also increase if thousands of new houses are built on this floodplain, and a permanently high river level will cause groundwater to rise beneath both new and existing homes. Local residents along the Ribble corridor have not yet been consulted. A large number of local residents are very concerned about these proposals. Local councils throughout the Ribble corridor have not yet been consulted. Fylde Borough Council and Freckleton Parish Council are amongst those opposed to the Ribble barrage. 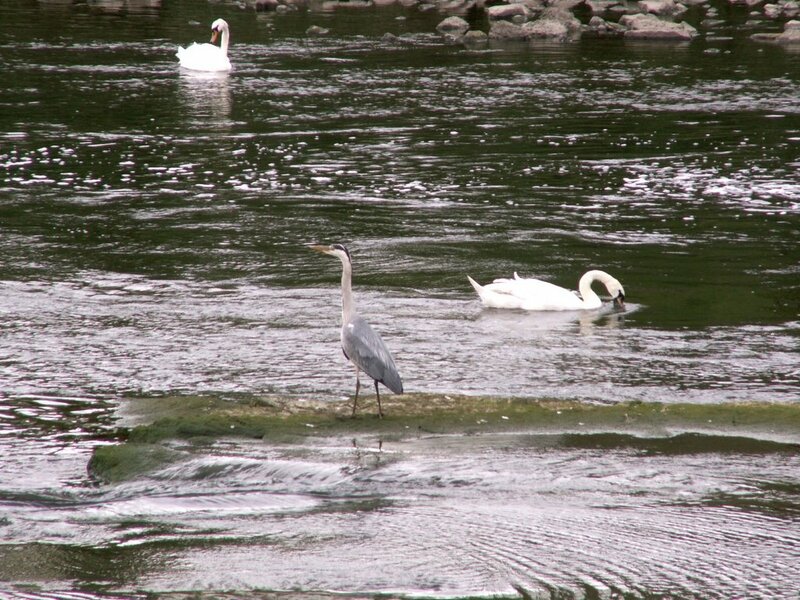 Environmental organisations who are actively concerned with the River Ribble have not yet been consulted. 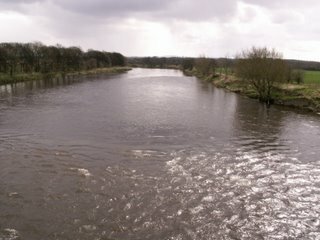 Environmental organisations are very concerned about the barrage proposal, including the Royal Society for the Protection of Birds, both the Lancashire and Ribble Fisheries Consultative Associations, the Wildlife Trust for Lancashire, Manchester and North Merseyside, the Ribble Catchment Conservation Trust, and Buglife. Preston Council leaders claim that the barrage will “enhance both the natural and built environment”. This ignores the crucial importance to wildlife of this internationally recognised intertidal habitat, and the beauty and character of this unique river. Four months since we raised these objections - and several years since the Riverworks ideas were first mooted, local residents and environmental organisations have still not seen any form of consultation - are we to wait until there is so much developers money behind these proposals that they are a foregone conclusion, and then have a tokenistic consultation where local people are asked for their views which are subsequently ignored? In an effort to raise the issues among local councillors we sent out this Letter to local councillors which we emailed to members of South Ribble, Preston, and Lancashire County Councils (plus a few others). d) that FULL consultation should take place with all of the above BEFORE any decision is taken to pursue these options further. We have continued putting forward calls for open, democratic consultation, rather than small cabals cooking up plans for Preston behind closed doors, most recently in Will Ribbleside residents voices be heard? Preston City Council's Composite Masterplan, republished on the blogsite on Views from the Riverbank of a Genuinely Sustainable Future, shows that land north of the river, in Preston itself, is being considered for development. If you look closely at the Taylor Young plan you can see the orange "New housing" area covering most of Frenchwood Recreation Ground from close to the Old Tram Bridge to the Esplanade. Development here would not only destroy a fine green space below Frenchwood Knoll but it would build over very popular playing fields used by amateur league soccer teams. This is at a time when greater participation in sport is being encouraged for health reasons by Sport England; when the UK is to host the Olympics in 2012; when many health workers and parents are concerned about child (and adult) obesity; and in Preston, the home of the National Football Museum. The increase in traffic along the Boulevard and Malvern Avenue to the new estate would mean more congestion and accidents at the bottleneck junction of London Road and Ashworth Grove (unless the riverside path is opened up for car traffic through Avenham Park? I guess nothing is sacred in Riverworks). We have had a lot to say in defence of our local allotments! The allotments are an asset to the local area. They provide recreation and exercise to local people of all ages. They add to the incredible biodiversity of the area offering habitat to a number of birds, mammals, amphibians and insects. They are fantastic recycling centres; vegetable waste is composted, old pallets and wood are reused, discarded pop bottles are used propagate seedlings in spring. I could go on. The high organic matter in the soil stores moisture ensuring minimal water wastage in times of drought. During rain they can also help to prevent flooding. 'I am seriously concerned that the proposed development threatens our allotment site. At 139 plots Penwortham Holme West is one of the largest allotment sites in Preston and also one of the oldest. There has been allotments on this site since circa 1913. Our site has a rich and valuable heritage and history. And it is not just Penwortham Holme West which would be affected but the allotment site at Penwortham Holme East as well. The health and social benefits of allotments and of gardening and growing your own vegetables are well known. Promotion of these benefits has finally being given support and is being widely advertised by government, local and health authorities. The Office of the Deputy Prime Minister has endorsed its support of allotment gardening and provision of allotment sites. Thanks to short-sited and commercially orientated decisions of many of our local authorities and the depredations of property developers many allotment sites have been sold off and built on. Once these sites go they are lost forever. Currently there is a national shortage of allotments and increased awareness of the value of sites. We also put forward a list of Ten Reasons Why Preston City Council Should Not Build Over Our Allotments. It is very contradictory that the Riverworks proposals should put forward the idea of building 4000 new houses, at a time when both Preston and South Ribble councils say they have a 'surplus' of housing in their areas. We explore this contradiction further in Riverworks - The Housing Sums That Don't Add Up. Lets get this straight - Preston City Council think there is 'enough' housing in Preston, and South Ribble Council think there is an 'oversupply' of housing in South Ribble - so why on earth do the Riverworks proposals suggest building 4000 houses? Where exactly did these ideas come from? These housing proposals are clearly neither wanted, nor needed, by Preston residents, so how did they come to be included in Riverworks? Who suggested it, and why is the council spending money on feasibility studies, and asking for much more money from the national lottery to push these ideas forward? The Save The Ribble campaign will be working hard to find out the answers to these questions. 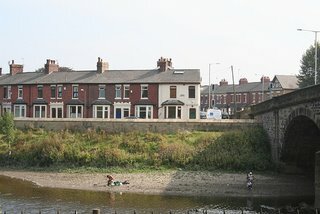 Much of the argument about the barrage is concerned with the behaviour of River water, the carriage of silts and their importance to the birdlife of the Ribble Estuary, and the interaction between tides, rainwater, marshes and mudflats - a precious balance that nourishes wildlife and protects us from floods. Just to put this into perspective, the Ribble Estuary SSSI (Site of Special Scientific Interest) is 9,226 hectares (22,798 acres) of combined mudflats, sandflats, and salt marsh. This is what makes the Ribble Estuary the 2nd most important wetland site in the UK, protected under the International RAMSAR wetlands convention, and a designated Special Protection Area under the EU Birds Directive and the UK Conservation (Habitats &c) Regulations 1994. The Ribble's wetland habitat is a dynamic system which changes, but comprises approximately 20% saltmarsh and 80% mudflats and sandflats. 6,730 hectares of this habitat are in Lancashire and 2,501 hectares in Merseyside. 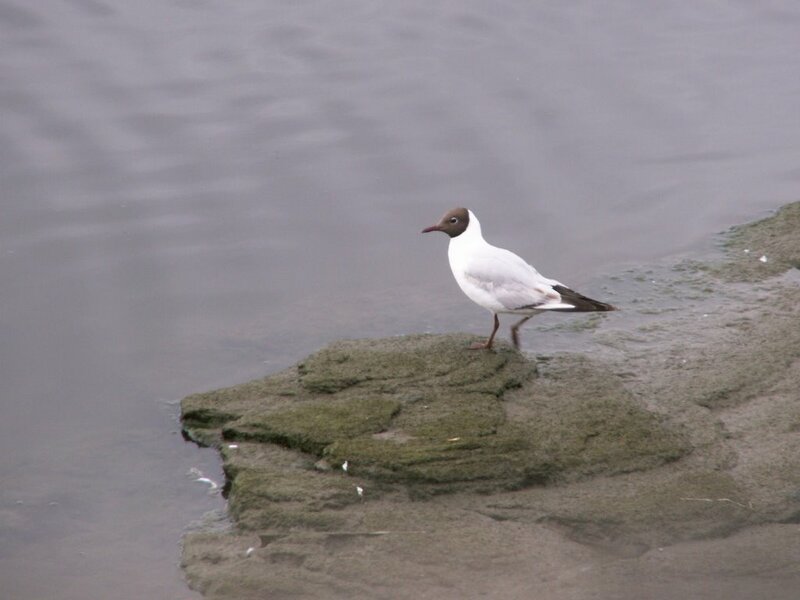 This estuarine wetland habitat is created and supported by the free-flowing tidal nature of the Ribble. Any changes in the free-flow of water, silts and nutrients - such as a Ribble barrage would cause - would put this internationally important habitat at risk, and deplete its flood defence capabilities. It has always been important for us to turn our blog into a forum where local people can post their opinions - so often ordinary people are ignored by councils and media in favour of the wealthy and powerful development companies - blogging is a way to counteract this, and make local people's voices more potent. We know our blog is minutely scrutinised by some people in Preston Town Hall - so your views go directly to the decision makers. There are a few ideas and myths floating round about Riverworks - that we debunk in Riverworks - Pub Debate Primer We hope that anyone that reads this will be able to argue the pro-river case in any beer-fuelled pub conversation! I have only pointed out a few of the really interesting and informative posts you can find on this blog - perhaps you have a personal favourite that you think I should have included - if so post about it below! There are as many reasons to save the ribble from these Riverworks ideas as there are people who love their local river, who appreciate wildlife and who are concerned about keeping their houses safe from flooding - we want more of your opinions, ideas and arguments so that our blog continues to represent your views and to build the movement against the Riverworks ideas. PS You can now download our window poster direct from this blog. Just click on the image below, then print out your result. parks but people could not be blamed for not knowing this as there is no indication of it. The path under Halfpenny Bridge is blocked (presumably by a landowner) and in general the Way is not well supported by any publicity. Perhaps the Ramblers Association would be supportive of your campaign if they knew of any threat to the footpath which may be created by the proposed developments by the city council. 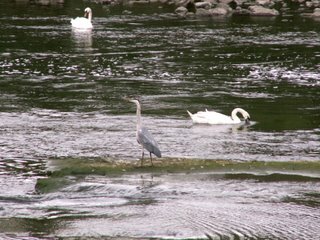 A barrage accross the ribble would mean more wildlife on the river. It would create a permanent expanse fo fress water which would atract wildlife. the river is just mud for half the time now. How attractive is a mud bank to look at? Anonymous - Can you explain how drowning the mudbanks (a source of much food for birdlife) and concreting over the riverbanks will lead to more wildlife? 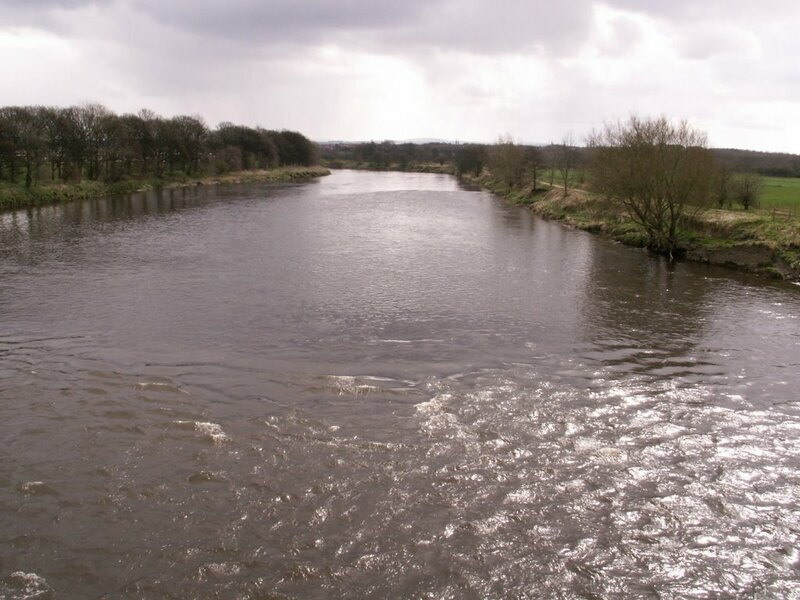 A barrage would slow down the river, meaning fish like the barbel would no longer thrive (they like fast moving water), it would be a barrier for fish like the atlantic salmon that come up the river from the sea to spawn. Any wildlife left in the river would be scared off by power boats and jet skis used on the 'water sports park', that Preston City Council want to bring in, a poor replacement for the football pitches at Penny Holmes, Vernons and Frenchwood Rec that would get housing built over them if the council gets its way. A barrier would also disrupt the flow of silts down the river to the Ribble estuary - 250,000 wild birds rely on these silts for their habitat. Instead these silts would accumulate higher up the river at the barrier, where they would drop to the river floor due to it's slower movement. By accumulating here, the silts would reduce the capacity of the river to hold floodwaters during periods of heavy rain or thaw. Those floodwaters will have to go somewhere. Quite: if a barrage on the Ribble would be of benefit to wildlife and the environment, then we wouldn't have a problem with it!!! CAN WE IMPROVE GREEN SPACES IN MIDDLEFORTH? Will Ribbleside Residents’ Voices Be Heard?